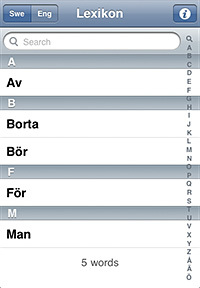 Lexikon was programmed to fill my needs to be able to access the Lexin Swedish – English Dictionary while out and about. A free online dictionary designed for immigrants to use by the Swedish government, and conveniently provides an API to access results. It caches the words to the save on bandwidth, to speed up repeat viewing and for offline access. Lexikon 2.5 is capable of accessing most of the dictionaries Lexin has: Albanian, Arabic, Bosnian, Croatian, Finnish, Greek, Kurmanji, Russian, Serbian (Latin & Cyrillic), Somali, Spanish and Turkish. 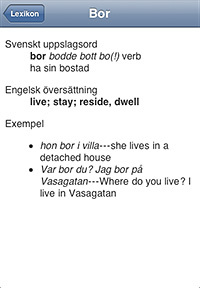 In addition you can use Lexikon as a normal Swedish dictionary without translations. 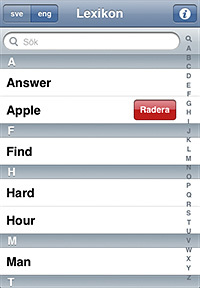 Term figures now also cache to the device for faster and offline access. Problems and feedback can be sent via email to .